If you ever tried to find the best content writer, you certainly know how difficult it is to find the best content writer who actually understands your brand’s purpose, content strategy, and audience demand. I’m writing this post because people reach me, bloggers ping me on Facebook, and brands email me for content creation. In fact, I have been working in freelance space for a while now, so I understand how companies and startups are hungry for fresh, useful, and helpful content for their audience. Are you looking to hire a content writer? Do you want to know what makes a content writer useful for your brand? Would you like to know what to ask him/her before hiring? David Trounce of Mallee Blue Media wrote about the idea of hiring a content writer for a small business. I think every business owner should check that out. 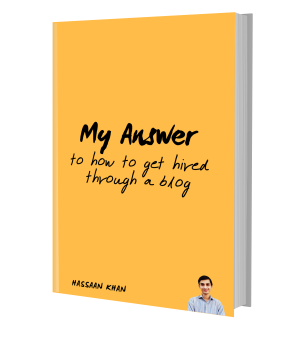 If you’re looking for such answers, I’m sure that you’ll get in this article because I’m pretty much clear on helping you out to find your next best content writer. Now you know that I know the purpose of this blog post. You might have seen freelancing sites, jobs portals, and facebook job groups – and, nothing has helped you yet. As I said. Just relax. Because I’ve got this covered for you. Before jumping to the clues where you’d find your content writer, let me tell you something important. Grant Butler of Content Marketing Institute tells you how to hire a content writer. You must know three things about hiring the best content writer. 1. Does he/she write to help and educate? If your content writing job’s candidate has written the content previously, then ask him/her to provide some good article links. What you have to see is, does his/her content deliver a helpful message? Has he/she written to solve the reader’s problem? 2. Is he/she good at engaging the readers? If you find out that you start reading your candidate’s content and it looks entertaining and you want to read more to find out that how does it go along. You might have come across the good one… because a very few content writers know how to engage the readers. The third thing is something you should not ask your content writing candidate, instead, you should observe whether he/she asks you or not. If your content writing candidate asks you about the content plan or content strategy, it means he/she has a pretty good idea of using the content. These are three things which might take your brand off the ground when you would hire your content writer who knows exactly what to do on his/her desk. So, that could be helpful for you. Next part is the cream. You’re about to witness some easiest ways to find the best content writer for your brand/blog/website. LinkedIn Pulse is a place where hundreds of thousands of authors, bloggers, writers, and professionals are writing their articles and publishing on LinkedIn. Their followers and contacts get an intimation of their articles publication. That’s our first area to sweep. Take a look at your LinkedIn account. If you don’t know how to visit LinkedIn Pulse area, just go to the Interests menu and click on the Pulse. You’ll be home. Check out a couple of articles, start over with the relevant titles, read some of the starting paragraphs of few articles, make a list of interested articles or their author profiles to reaching them out. It isn’t that easy. When you start looking over the articles at LinkedIn Pulse, many of the articles would be published by LinkedIn Influencers, and you’ll see hundreds of thousands of views on those article. Influencer is a LinkedIn user category that automatically given to a few hundreds of LinkedIn users who were extremely popular and engaged with their large following. This isn’t something that you can buy or apply to get it. So, the point is, you may not want to hire an influencer who charges thousands of dollars to speak at the conference, and I promise you won’t be able to. Let’s come to the point where we can sort things out. Besides those influencers, you’ll find many of the Pulse posts written by your LinkedIn network members and other writers publishing on Pulse. So, that’s how you’d be able to get your hands on some of the talented writers. You should reach them, talk to them, ask for their rates, and get started with them. Evan Porter explained How and Why should you Write on LinkedIn Pulse. He did it amazingly and described the importance of this publishing platform. 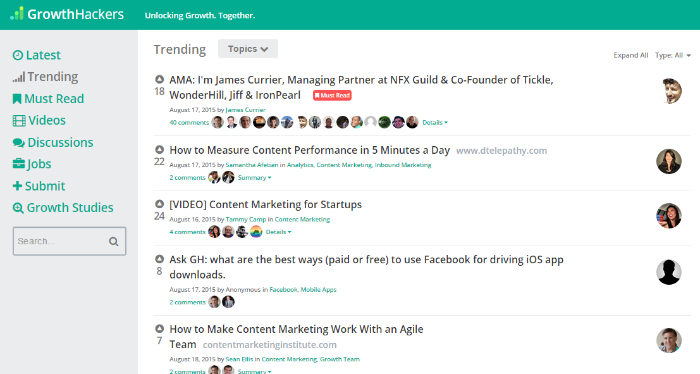 Growth Hackers is a community of growth hacking experts, inbound marketers, bloggers, and content marketers where they share, read, comment on others’ content. It works on voting and the content that gets more votes goes up on the wall followed by the other content. The best part is that you won’t always find the top guys hanging out on growth hackers, you will always find the guys who are beneath those top guys. People also share others’ content on this network. The purpose of sharing the top content marketers’ and bloggers’ content is to get the traction. People vote for the content, they comment, share, so somehow you start engaging with the audience. Besides that, you get a chance to share your own content once in a while. The amazing thing about this platform is, you get to find the most engaged, relevant, and dedicated people regarding content marketing, writing, and publishing. There are categories like videos, discussion, jobs, and trending which aren’t actually my focal point. It’s your chance that how to do you present yourself, how do you participate in delivering something to the GH audience, and what do you do to get a followership on this platform. Every member of Growth Hackers can follow others and can be followed by the other members. Suppose, you see an attractive headline with lots of votes on Growth Hackers. Find out who shared that article, who are commenting, and who actually wrote that article. 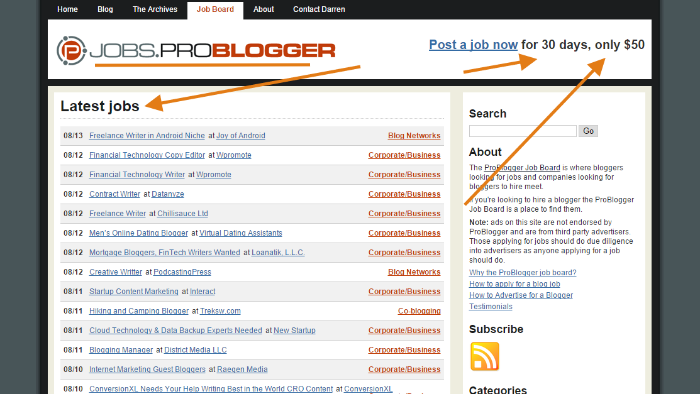 Most of us know about Problogging Jobs board. It’s popular and you may find world’s best blog writers through this platform. I’ve read somewhere that when you publish a blog writer job on this job board, you’re likely to get dozens of job applications from best blog and content writers. It costs $50 for 30 days posting but it’s worth it. If you’re finding a content writer from USA, Australia, or UK, then this job board will be the perfect choice to make. The advertising and marketing agencies don’t want to risk and spend some time on testing some random content writers, so they prefer such platforms to meet the high caliber writers within no time. The idea of finding the niche blogs leads to the top contributors in that niche. It’s right. If you find the authoritative content in your niche, you’ll find the guys behind that content. Although, you need to analyze that either those blogs are authoritative blogs or not. Use Open Site Explorer to find out about Domain Authority, Page Authority, and Backlinks. Use Page Rank Checker to find out the page rank of the domain, and use Alexa toolbar to find its global Alexa rank. But how to find such content? Use Twitter Hashtag to find the niche blogs. When you find the niche blogs, you’ll find the specific niche writers, so obviously you have to find the blogs in your niche. For instance, if you are searching the writers for content marketing niche, you should search with #contentwriter on twitter. Try out different options in the search area such as #contentwriter, #blogwriter, #ghostwriter, #blogging, #writing etc. You’ll find a variety of tweets and content. Most of them would have shared their content using similar hashtags, you have to dig in into their profiles and read their bio to find out exactly who can work for you. The hashtags are just the direction signs, twitter bio will be roads. Sort out some of the writers. Send them tweet showing that you’re interested in talking to them about your writing gig. Visit their blogs to find out their email addresses. 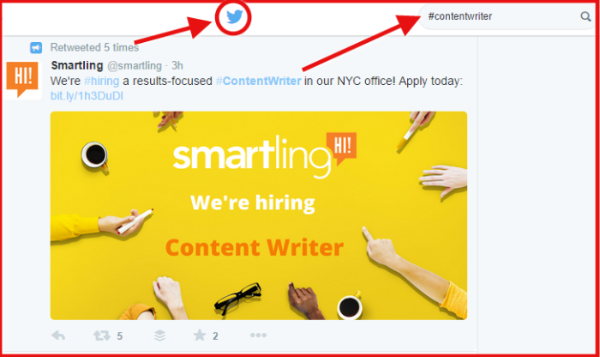 Tweetdeck is another fantastic way to find the trail of the best content writers. It also works on twitter. The benefit of using tweetdeck desktop version or web edition is that you can keep an eye on the various twitter functions at the same time. You can look at the tweets from the people you follow, in the next column you can select a hashtag to keep looking for the latest tweets for hours and hours, you may like to see your notifications in the next column etc. This twitter dashboard software can help you in finding your next content writer. I promise it works. Social media is the best way to engage the people, meet new people, and discuss the matters. Of course, it requires you to be at the right place to discuss the matter or share your views. Sharing of views and sharing of content are actually different things. If you just come and share your blog posts on the social platforms, people won’t buy it, because they don’t know you. You have to make them feel that they know you, which is why the best way to engage the people is helping them through social discussions. Give your best advice according to the topic and share whatever you can share to help the cause (topic). Sharing authoritative and influencer’s content always works. Try to share others content. Now the point is how would you find the content writer on those social discussion channels like LinkedIn groups and Facebook groups. It’s not a rocket science. All you have to find out the people who have the SAY and people listen to them. Also notice who are popular and what they are saying. You can easily look at people’s profile on Facebook and LinkedIn to find out what they do. If you’re looking for a content writer, and someone shares his views that look legit, go to his/her profile, check it out what does he/she do. If he/she is a content writer/copywriter, ping him/her to start the conversation. Blog comments is a popular way of engaging the bloggers and authors. You might find blogs with hundreds of comments on every latest post. Blogs like Copyblogger, Problogger, Backlinko, Quicksprout, and Buffer blog have hundreds of comments on each blog post. Read people’s perspectives. Find out what they think. The comments are a best way to judge the content writer’s caliber and approach. You could find the link of the commenter on his/her comment. Go, check out his/her blog. If you he/she sounds good then proceed to contacting him/her. Disqus has been a quite popular commenting utility on the websites and blogs. It works as a commenting plugin on WordPress blogs. It has turned out as a social media tool lately because now users can create their profiles, follow people on disqus, upvote or downvote the content, and join the communities on Disqus. And, the amazing thing is that it’s rapidly growing. Commenters need to create their Disqus accounts to comment on all the blogs using Disqus commenting system. It keeps the record of the previous comments of the commenter. 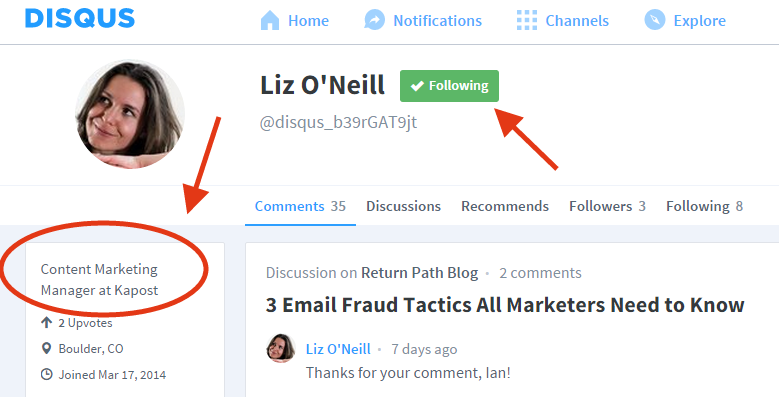 What Disqus has to do with finding the best content writer? You must be thinking that. Well, you can meet many professionals on Disqus. If you don’t use this tool then try it out or start getting engaged on the blogs which are using this plugin, you will notice that profiles have designation and URL options to engage the readers/followers. It means you can contact people through their profile details. Look at their profiles, find the right guys, and approach them via commenting. It also recommends you similar content to check it out or get engaged. Buzzsumo tells you about the popular content against your keyword and gives you the list of top results which are ranked in terms of social sharing across all major social media platforms. This tool has been emerged as a major social media analysis tool as experts highly rely on this tool to find out about the popular content on social media. It’s the best way to find the expert writers in a specific niche. Because you use the keyword or phrase, you will be using to find that type of content and you’ll obviously get the most shared content on the social media on your screen. Ideation is a online tool which hunts the content against your keyword and gives you the popular content across the social media. It’s an alternative to Buzzsumo. People don’t know much about this tool but it works. 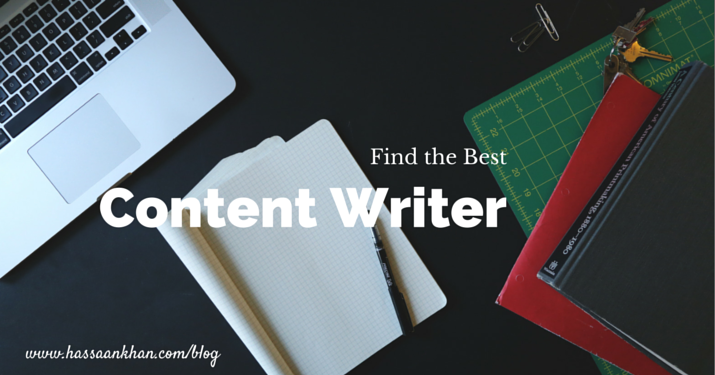 So start finding the relevant content to meet the writers/bloggers behind that content. Pursue the content writers who have written those high-quality articles and try to make a deal with them for your blog or company. 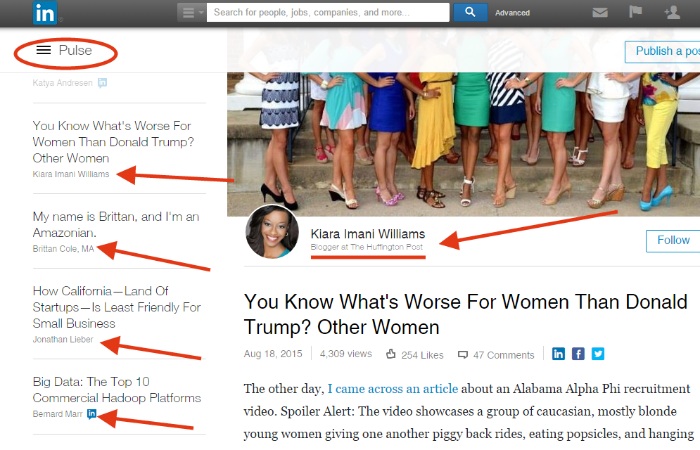 Quora is another popular social media tool. The hunt of best content writer could possibly end here because Quora is one of the most popular social media networking sites. It’s actually a Q&A site with a huge user base. People ask questions to the relevant experts and professionals, and those experts and professionals reply (if they want to). Quora has got a profiling system with the options like follow, messaging, upvote, down vote, and much more. Your brief bio and URL in the profile description might land you some great content writing opportunities if you are a content writer and using Quora. All it takes to use it properly. Every social networking site requires dedication, genuine relations building, and helping others. This might look new or strange. But trust me, you might find the guy you’re looking for. We all know that adding relevant links to our content and linking to the relevant contents are important outreach strategies, besides that, there is an opportunity to find the content writer in this. This article of SEOChat also explained the linking of relevant content. The best way to do that is search any topic of your niche on google, you will come across the relevant content, go check out some of the articles, and the authoritative content on many of the blogs that will be linking to the relevant articles. Every blogger wants to help the readers, somehow. And, linking relevant content in our content actually helps the readers, as a reader, you have to pursue those links in the content to reach the others guys. You might get closer to hire your next content writer. But still I mentioned all the strategies which I have used and tested — And, somehow, I believe that there is a potential in these methods. At least, I’d feel comfortable and relieved that I tried to help and shared everything possible in this context (of hiring the best content writer). Have you ever hired a content writer for your blog? How did you find him/her? Share with us. Some of them really new ways to find the quality content writers that I didn’t know before. However, I would like to promote some of these portals that may help me to promote myself as a writer. I hope you found something helpful. Great post. I would never have thought about LinkedIn Pulse, but that’s a great source! Thanks for sharing. ???? Also think that the Quora platform could be good. Will definitely pass this on to some colleagues who are looking for content writers. I write my own, and if I need help, have a team already onboard. Awesome article. Have a great weekend. I’m excited you liked my post. Yes, LinkedIn Pulse is a great source and it could be the NEXT BIG THING. Thank you so much for liking and sharing with friends. Fab tips. Thanks for sharing! 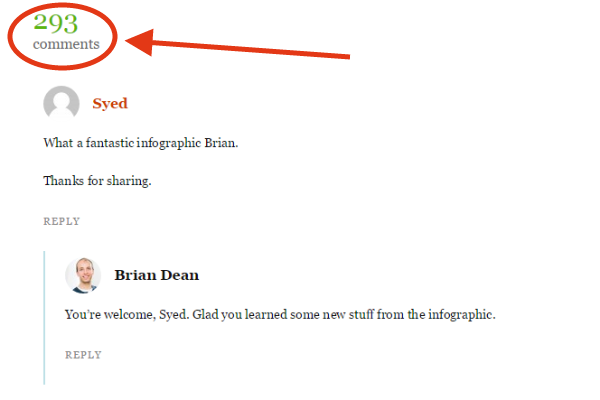 I’m happy you visited my blog. Thank you so much. The idea was to tell people/companies that there is a bundle of opportunities scattered out there which may help them in hiring the content writers. Disqus is certainly a great web utility to use and engage people.